There's not a single thing in your car that hasn't been shaped by motorsports in some form or another. From fluids (fuel, oil, coolant, etc.) tires, to even the petroleum-based compounds used to pave the streets, the overall impact has been incalculable. For example, your neighbor's Prius wouldn't be what it is without generations of race engineers motivated to improve efficiency—fuel, aerodynamics, rolling resistance—not because they care about the environment, but because they had to win races. In a very tangible sense, racing at the highest levels is now and always has been competitive research and development between corporations. These are just 11 ways in which they've made the car you drive better. There was a time when a car was considered advanced simply because it had a braking mechanism of some sort on all four wheels. The Jaguar C-Type outright revolutionized brakes in 1952 not just by using disc brakes, but using calipers that squeeze the discs, just like nearly every car you can buy today. Jaguar went with the system because it was easier to keep cool, thus it was more effective over a long period of time, like, say, the 24 hours of Le Mans, which the car won. Twice. Depending on when you grew up, your car seat likely had a five or six point racing harness built into it designed to keep a driver firmly in his or her seat, no matter what. Think about that the next time you buckle yourself into that puny three point harness you call a seatbelt. The first supercharger was actually invented to pump air into industrial furnaces. And while a design existed for a supercharged motorcycle engine, both Gottleib Daimler (as in Daimler-Benz) and Louis Renault had thought about a supercharged engine, the earliest known instances of anyone actually doing it involve racing. A small Pennsylvania carmaker named Lee Chadwick introduced a supercharged car that produced 60 hp. 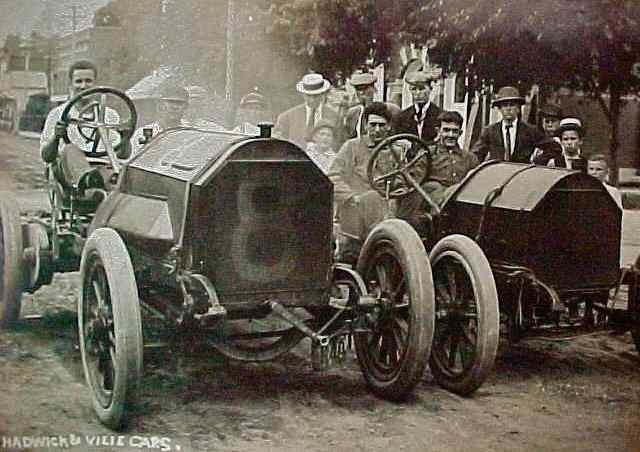 In 1908, it went as fast as 109 mph, and, were it not for reliability issues, it would've won all sorts of early races. The first instance of a rear view mirror on an automobile was on the exact car that won the very first Indianapolis 500...and it was more or less a means of skirting the competition's rules. While every other car required a mechanic to ride shotgun to keep an eye on the traffic behind it, the Marmon Wasp was designed to just carry its driver. That driver, Ray Harroun, happened to be an engineer, and he mounted a mirror so he could see what the mechanic couldn't tell him. The Kammback design was developed by Nazis, but first used by 1960s race cars like the Shelby Daytona. In essence, the chopped rear end drastically reduced the car's drag, making it more efficient and resulting in a faster top end. It's that same principle that influences the shape of cars like the Prius and the Honda CR-Z. Ever hear of ground effects? Controlling the air under the car to help keep it stuck to the road was pioneered by Chaparral, a small west Texas race team that ultimately developed a car that in terms of sheer pace was miles ahead of Ferrari and Porsche. Wings? Those, you probably knew, but the first started to sprout up in the mid 1960s at Indianapolis, and shortly thereafter in Formula One and CanAm. CORRECTION: One of our readers correctly pointed out that the first known wing on a car actually appeared at a dirt track in 1959. The notion of the car's computers taking an active role in adjusting the suspension (i.e., in "sport mode") really took off in the late '80s and early '90s with a series of successful experiments in Formula One, culminating in Nigel Mansell winning his only world championship in truly dominant fashion over mere drivers like Ayrton Senna. Today, a car continuously adjusting itself is fairly commonplace. While a few early electric cars put power to the front and back, the first car to use a mechanical four wheel drive setup like you think of today was a 1903 Spyker 60 HP, designed specifically to race in cross-country rallies in an era when there weren't paved roads. Many decades later, some of the legendary Group B cars cleared the way for mass-popularization of the layout. Side note: The unique drivetrain wasn't the Spyker's only first: it was also the first six cylinder in history. *Andrea DeCesaris walked away from that accident unscathed. Porsche first bolted a dual clutch transmission onto its 956 race car late in 1982. Because it can shift faster than a human, the drivers didn't need to let off the throttle, and as a result, the 956 was able to side-step an otherwise significant turbo lag issue. By the early '90s all of F1 used it, with companies like Ferrari starting to transfer the tech into their road cars. Now you can order it on cars costing $40,000. Carbon fiber? Yep. Kevlar? Mmm-hmm. Motorsports, then supercars like the F40 and McLaren F1; now, dashboard appliques you buy on eBay for $25. There's practically nothing on your tire that hasn't evolved from racing. Tread? It moves water out of the way at high speed, sure, but those blocks are specially designed to keep everything stable while you're cornering. The belts holding tires together are a big reason you can safely drive over 100 mph today without fear of a blowout. No one group of drivers know and depend more on tires than racers. Thank the next one you see for this. Aaron Miller is the Rides editor for Supercompressor, and he really could go on forever about racing's influence on street cars. Feel free to ask away on Twitter.